open from 9:00am to 8:00PM on Mondays to Fridays and from 9:00am to 5:00pm on Saturdays, Sundays and Public Holidays. From now to October 31, 2011, you can purchase Magic Access Membership Certificate from the Hong Kong Disneyland Ticketing booth at Level P2 of The Peak Tower, open daily from 12:00pm to 9:00pm. From now until October 31, 2011, receive a Free Hong Kong Disneyland 5th anniversary limited edition umbrella for every purchase of 2 Magic Access Membership CertifIcates at Hong Kong Disneyland Ticketing Booth at the Peak Tower. Guests staying at Hong Kong Disneyland Hotel or Disney's Hollywood Hotel can purchase a Magic Access Membership Card at the hotel front desk on the day of check-in or the day visiting the Park. Guests can purchase a Magic Access Membership Card on the day of their visit at the Main Entrance Ticket Booths, open daily from 30 minutes before Park opening until Park closes. CTS in the airport closes at 10:00 P.M.
CTS does not offer outright discounts for Disneyland but they do have a combo ticket that comes with a meal voucher. Meals cost above 50HKD so you will save money if you avail of the combos. They also have combos for 2 meals + drink/snack. For the 3 in 1 combo you can save as much as 100HKD. CTS in the airport does not operate 24/7, they close at 10:00 P.M.
We suggest this if you want to avoid the long lines. Some hostels sell discounted admission tickets to Hongkong Disneyland. So inquire at your hostels. Travel Easy Traveleasy Ltd Shop 316, 3/F, Worldwide House 19 Des Vouex Road Central Central MTR Exit B.
Tel Number: 2522-5263. Open from 10:00 a.m. to 6:30 p.m. We discovered this place on a Sunday when Travel Easy was close in 2008.
can you please tell me how much the disneyland ticket price at sally's shop? Great! 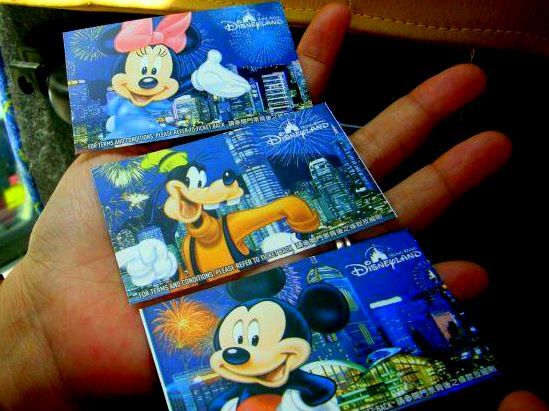 It will really fantastic & helpful information, regarding to Hong Kong Disneyland Tickets. Can I get the tickets instantly at CTS, air port counter? Yes, you can get your tickets instantly at the CTS Counter at the airport. Have a happy trip! can we use credit card in purchasing disneyland tickets? I have a extra ticket to Disneyland that I got for free from the hotel when we stayed there. Please free free to contact me if anyone is interested in buying it. The ticket I have is a 2day pass for a child. If anyone plans on going I will sell it for a cheaper price.